These two programs are parts of a long-term weight training program for women published in my ebook. The long-term weight training program is called Maximum Curves and Functional Strength (MCFS). As its name implies, MCFS is intended for women who want to develop maximum curves and a functionally strong body. MCFS is summarized in Table 1, along with the other weight training programs for women published in my ebook. As you can see from Table 1, MCFS consists of six smaller programs (mesocycles). The Women’s Plateau Buster is a stand-alone program that is designed to help women break through plateaus (a plateau is when you stop making progress, which usually occurs when your body adapts to the training stimulus). Since the program is designed to produce the same results as MCFS, it can also be included as part of MCFS and used after MCFS 5. The Minimalistic Program for Busy Women is another stand-alone program. It is designed to provide a quick and effective full-body workout for women who have very little time to spare for the gym. The training programs for women can be completed at any gym. In the ebook, I also provide alternatives for cable and machine exercises so that they can be completed at home using basic equipment. All of the programs are explained in detail below. encourage the right strength balances between your opposing muscle groups, which is important for proper posture and movement, and to prevent imbalance-related injuries. 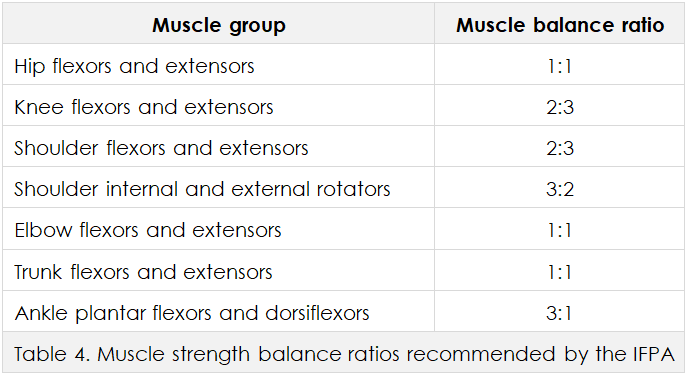 recommended muscle strength balance ratios. In programming terminology, MCFS is a macrocycle (“big cycle”). The six individual programs that make up MCFS (from the Women’s Beginner program to MCFS 5) are known as mesocycles (“middle cycles”). Although not expressed in Table 1, most of the mesocycles are themselves divided into microcycles (“small cycles”). The mesocycles and microcycles incorporate variations in training, which will be explained in the mesocycle overview. MCFS lasts for a minimum of one year and 13 weeks if you move from mesocycle to mesocycle and take a deload week after each one. A deload week is a week during which you either rest or train lightly. However, apart from the beginner mesocycle, you do not have to move from one mesocycle straight on to the next one. I balanced the exercises in each mesocycle as best as I could so that you can keep repeating each mesocycle over and over without much of a risk of developing muscular imbalances. As such, you can repeat each mesocycle as many times as you want to before moving on to the next one. This will ensure that you get the most out of each mesocycle and the macrocycle as a whole. In fact, you don’t have to move on at all. If you enjoy a particular mesocycle, you can stick to it. Provided you keep increasing the amount of weight that you lift, as requested in the instructions of each mesocycle, you should see continual progress for a significant amount of time. Just make sure that you take a deload week before repeating a mesocycle or moving on to the next mesocycle. Note that the deload weeks are important. Please do not ignore them. They will help you to fully recover and therefore keep making progress. They will also increase your likelihood of not giving up. Before I provide an overview of each mesocycle (Table 2), I must make it clear that training in different rep ranges leads to the development of different muscle properties. More specifically, using a weight with which you can perform 13–20 reps in good form is optimal for developing muscular endurance; using a weight with which you can only perform 6–12 reps in good form (i.e. a heavy weight) is optimal for developing muscular size; and using a weight with which you can only perform 2–6 reps in good form (i.e. a very heavy weight) is optimal for developing muscular strength. Focusing mostly on the 13+ rep range, the 12-week women’s beginner mesocycle is designed to build a strong foundation of muscular endurance upon which muscular size can be built in the more advanced mesocycles. It is intended for beginners, individuals who have less than three months of consistent weight training experience, and experienced gym-goers who haven’t trained for over three months. The 8-week MCFS 1 mesocycle starts to build muscle in the 9–11 rep range. It also incorporates an intensity technique known as superset training. You can start from this mesocycle without having to go through the beginner mesocycle only if you have at least three months of consistent weight training experience. The 10-week MCFS 2 mesocycle is composed of microcycles that alternate between the 9–11 and 6–8 rep ranges (you will learn below why rep ranges are alternated). This mesocycle includes an intensity technique known as training to failure. You can start from this mesocycle only if you have at least six months of consistent training experience. Like MCFS 2, the 10-week MCFS 3 mesocycle consists of microcycles that alternate between the 9–11 and 6–8 rep ranges. The mesocycle includes an intensity technique called dropset training. As with MCFS 2, you can start from this mesocycle only if you have at least six months of consistent weight training experience. As with MCFS 2 and MCFS 3, the 8-week MCFS 4 mesocycle consists of microcycles that alternate between the 9–11 and 6–8 rep ranges. It includes an intensity technique known as rest–pause training. You can start from this mesocycle only if you have at least nine months of consistent training experience. Although the 12-week MCFS 5 mesocycle also comprises microcycles that alternate between the 9–11 and 6–8 rep ranges, it is different from the other mesocycles in that all of the exercises are arranged into supersets. As such, the workouts are more intense and quicker to complete. You can start from this mesocycle only if you have at least 12 months of consistent weight training experience. Why alternate between rep ranges? The process of alternating rep ranges in microcycles is known as undulating periodization. Since training in different rep ranges leads to the development of different muscle properties (endurance, size, or strength), undulating periodization will help you to simultaneously develop and maintain different muscle properties. In this instance, you will mostly be alternating between the 9–11 and 6–8 rep ranges, which are both primarily for building muscle. However, the 9–11 rep range will help you to develop muscular size and maintain a bit of endurance, while the 6–8 rep range will help you to develop muscular size and more strength. The extra strength will assist you in lifting heavier weights, which will help your muscles to grow, which will in turn help you to lift even heavier weights — thus promoting a cycle of growth. I could have had you also alternate the 13+ rep range for maintaining the endurance that you develop in the beginner mesocycle, or I could have had you also alternate a 3–5 rep range for developing maximum strength. However, the endurance rep range would have significantly increased the time that it takes for you to build shape and curves (muscle), and the maximum strength rep range just doesn’t appeal to most women. The 8-week Women’s Plateau Buster is your weapon for breaking out of plateaus, should they ever occur. You can also use it as if it’s the seventh MCFS mesocycle, and repeat it as many times as you want to. 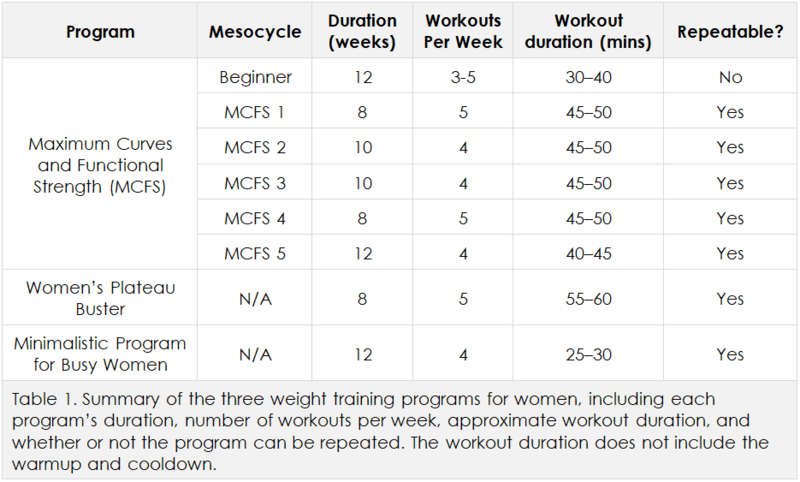 As with the MCFS mesocycles, the Women’s Plateau Buster consists of microcycles that alternate between the 9–11 and 6–8 rep ranges (Table 3). The difference is that most of the exercises are arranged in accordance with an advanced intensity protocol known as pre-exhaustion training, which will ensure that you partially exhaust prime mover muscles using isolation exercises before you move on to the main compound exercises. Pre-exhaustion of prime movers makes them work much harder during the compound exercises, thus amplifying the stimulus for development and increasing your chances of kick-starting stunted progress. If you’re new to weight training and follow MCFS, you will almost certainly not need this program as a plateau buster for at least a couple of years. However, if you ever do need it, it should ensure that you never stop making progress. The 12-week Minimalistic Program for Busy Women is for you if you don’t have much time for workouts. Alternating between the 9–11 and 6–8 rep ranges, the workouts include the bare minimum of exercises and sets necessary to get an effective full-body workout and try to promote continual development. What’s more, the exercises are arranged into supersets, which means that you can fly through them very rapidly. Apart from a few basic adjustments to emphasize glute development, the Minimalistic Program for Busy Women is similar to the Minimalistic Program for Busy Men. As such, although it should take you quite far in terms of developing shape, it will not give you the kind of curves that you could get with MCFS. You can repeat the minimalistic program as many times as you want to. If a beginner, ideally, before you start the program, you should have completed at least microcycles 1 through 3 of the MCFS beginner mesocycle. As with the minimalistic workouts, the workouts of microcycles 1 through 3 of the MCFS beginner mesocycle are short, and they will help you to develop a small foundation of muscular endurance upon which the minimalistic program can build. How do the women’s programs differ from the men’s ones? Men and women usually train for different goals. Men usually want maximum muscle and strength, whereas women usually want maximum shape and “tone”. The training programs have been adapted to meet these different needs by incorporating different exercises and rep ranges. Therefore, the men’s and women’s training programs follow the same primary strength and conditioning principles. Ladies, this means that you have to train (and eat) for muscle growth, just like the men have to. In other words, in order to develop the shape and tone that you want, you have to lose the light dumbbells and hit heavier weights! Will heavy lifting make me look bulky, like a man? No, because women generally possess ten times less testosterone than men do, so you should never expect to grow as muscular as a man unless you take testosterone artificially. Also, women add muscle at a slower rate than men do, which means that you have more than enough time to notice that you are getting too muscular and adjust your training. Ladies, please do not be scared of heavy lifting. This fear will prevent you from getting the results that you want! If you want shape and tone, you have to build muscle in all of the right areas of your body, and the only way to do that is to lift heavier weights. The goals of all of the weight training programs for women are to develop and maintain curves and functional strength, strengthen the body’s primal movement patterns, strengthen the core, and encourage the right strength balances between opposing muscle groups. Most of the exercises used in the programs were selected to meet those objectives. I explain how below. However, some exercises were included for other purposes, such as to prepare you in one mesocycle for more advanced exercises in the following mesocycle, or simply to add variation to the workouts to keep you engaged. When designing long-term training programs that will be repeated over and over, you must select exercises that promote appropriate strength balances between opposing muscle groups. The reason is that if opposing muscle groups develop significantly different strengths, the risk of sustaining injuries and developing problems related to muscle tightness, joint instability, and posture will be increased. In order to reduce your likelihood of developing imbalances using my programs, I designed the programs in accordance with the muscle strength balance ratios recommended by the International Fitness Professionals Association (IFPA; Table 4). ensure that the number of exercises and sets prescribed for opposing muscles and opposing movement patterns generally agree with the ratios. For example, since the strengths of your hip extensors and hip flexors should be equal, I tried to make sure that the number of exercises and sets that hit those muscles is approximately equal. Note that balancing the beginner program wasn’t as important as balancing the other programs because the beginner program isn’t intended to be repeated over and over again and is designed to prepare you for the subsequent programs. Even so, it is still relatively balanced. Generally speaking, curves are the product of having a high shoulders-to-waist ratio and a low waist-to-hips ratio, producing the desired hourglass figure. In order to promote these ratios, I ensured that MCFS and the plateau buster program include an appropriate balance of exercises for shoulders, hips, inner and outer thighs, and especially glutes. This always leads to complications, which I’d like to briefly share. One of the complications is that many exercises that are great for glutes, such as the squat and lunge, are also great for quadriceps. Since most women don’t want big quadriceps, I prescribed variations of these exercises that emphasize glutes and hamstrings over quadriceps (such as the sumo squat and the forward-leaning lunge). All the while, I had to maintain the recommended quadriceps–hamstrings balance. Another problem encountered when designing training programs for curves is that the relatively large number of glute exercises have to be balanced with hip flexor exercises because the hip flexors are the opposing muscle group. The issue is that beginners with a weak rectus abdominis who perform lots of hip flexion exercises using improper form can develop lower-back problems because the rectus abdominis can’t counter the hip flexors’ pull on the lumbar spine. Therefore, I had to make sure that the beginner mesocycle started by strengthening the rectus abdominis a little, before gradually easing hip flexion into the mix. Then, of course, I had to balance the ab exercises with exercises for the erector spinae, which oppose the abs and should ideally be equally as strong. improve your overall fitness and athleticism. Unfortunately, most training programs that you encounter do not cover these movement patterns. Instead, they focus on training muscles, often in isolation, which is not how the body is designed to work. Rest assured that the weight training programs on this website and in my ebook, together with the FCT cardio program, incorporate effective functional training and give you the benefits outlined above. transfer weight from your lower body to your upper body. Your core is also where you generate much of your power. As such, it acts as your power base, power transfer center, and stabilization facility. Having a strong core is therefore of major importance for progress and overall fitness and athleticism. Proper core training involves performing a range of major compound and functional exercises designed to strengthen both the deep and superficial muscles of the core, ideally, both dynamically and isometrically. All of the weight training programs on this website and in my ebook incorporate effective dynamic core training, while some also include isometric core training. If you get bored of an exercise, or if you can’t perform an exercise for some reason, you can swap it for one of the alternative exercises below without significantly affecting the balance of your program. Note that if you read the Target Muscle Guide in the ebook, you will have a better understanding of muscle targeting, after which you will be able to identify alternative exercises by yourself! Very kind, Jen. Thank you.